We’d love your help. Let us know what’s wrong with this preview of French Exit by Patrick deWitt. Frances Price – tart widow, possessive mother, and Upper East Side force of nature – is in dire straits, beset by scandal and impending bankruptcy. Her adult son Malcolm is no help, mired in a permanent state of arrested development. And then there’s the Prices' aging cat, Small Frank, who Frances believes houses the spirit of her late husband, an infamously immoral litigator and world-class cad whose gruesome tabloid death rendered Frances and Malcolm social outcasts. To ask other readers questions about French Exit, please sign up. What also got lost on me, is why she had to spend all the money as she could have left it to Malcolm, who - she knew - was not capable of taking care of himself financially. Any ideas on that one? In what period does this book take place? Early 20s, early 21s century? 1800s? Anthony Williams I would say the early 2000's as euros exist in the novel. 3.5 Original, inventive, absurdist, all of these descriptions and more would be fitting. Wasn't quite sure where, in my head, to put this book, let alone how to come up with a rating. Generally, I rate like grnres with like genres, but this one seems to have an identity of its own. What a strange tale with some very unique characters, and a very unusual cat. A satirical comedy of manners and errors, if you will. Maybe I was just in the mood for this, but I enjoyed this quirky little albeit unbeli 3.5 Original, inventive, absurdist, all of these descriptions and more would be fitting. Wasn't quite sure where, in my head, to put this book, let alone how to come up with a rating. Generally, I rate like grnres with like genres, but this one seems to have an identity of its own. What a strange tale with some very unique characters, and a very unusual cat. A satirical comedy of manners and errors, if you will. Maybe I was just in the mood for this, but I enjoyed this quirky little albeit unbelievable story. It wasn't meant to be believed, but it does have some truisims within that were noted. This author is a master at dialogue, even when it was out there, way, way out there, the dislogue seemed totally natural. Some of these scenes I just found so darn amusing, had to reread them again, sometimes they seemed to just appear out of nowhere. So without rehashing plot, which is kind of impossible anyway, I'll just say I enjoyed this. Not the ending so much, but definitely the getting there. So, if you're in the mood for something different and entertaining, give it a shot. Frances Price has never really given a damn about what people think. A wealthy widow, she looks down on nearly everyone with whom she comes into contact (except Joan, her best friend since childhood). She and her adult son, Malcolm, live in an aging apartment on the Upper East Side and spend money indiscriminately, despite multiple warnings of increasing intensity from their financial advisor. One day, Frances is told that she is on the verge of losing everything, and she must sell off all the po Frances Price has never really given a damn about what people think. A wealthy widow, she looks down on nearly everyone with whom she comes into contact (except Joan, her best friend since childhood). She and her adult son, Malcolm, live in an aging apartment on the Upper East Side and spend money indiscriminately, despite multiple warnings of increasing intensity from their financial advisor. One day, Frances is told that she is on the verge of losing everything, and she must sell off all the possessions she can if she is to have any money left to live on. She decides her only recourse is to cash her remaining funds into Euros and spend the rest of her days in Joan's unused Paris apartment. Despite being engaged—although his relationship, like much of his life, is in a state of arrested development—Malcolm prepares to head to Paris with his mother, and they also bring Small Frank, the Prices' cat, whom Frances is convinced contains the spirit of her late husband, an immoral and unethical lawyer. The trio make their way to France on a cruise ship and find themselves in the midst of a few strange encounters. And when they arrive in Paris, although their financial situation is somewhat dire, Frances doesn't seem too concerned, and treats much of her time as an adventure. But ultimately, Frances has an exit strategy, and nothing can dissuade her from carrying out her final plans, not the disapproval of her husband/cat, nor Joan's concerned appearance in Paris. Frances and Malcolm begin befriending a motley crew of Parisians, who take up residence in Joan's apartment, which becomes even more crowded with the arrival of more unexpected guests from New York. Hijinks ensue, and for the first time, Malcolm is awakened from his doldrums and forced to act. But ultimately, this is a quirky, wry commentary on what it's like to have and have not, and the interesting relationship between mothers and sons. This was an interesting book, because there was a balance of introspection, character development, farce, and tragedy, and I wasn't sure exactly what Patrick deWitt really wanted us to feel. deWitt does zany well—his first book, The Sisters Brothers is a western of sorts with more than a healthy dose of quirk, and while I didn't read his second book, I heard it was something similar. I read this entire book on a plane so it was definitely entertaining, just a little bizarre. If you're not a fan of books that get pretty quirky and treat serious topics in a lighthearted way, you're probably wise to steer clear of French Exit . Otherwise, it's an enjoyable read, although a little frustrating, and it paints an interesting portrait of a mother and son who need each other more than they'll care to admit. Oui - Patrick deWitt’s latest novel French Exit is tres bonne! It’s this pleasingly bizarre comedy about nutters that reads uncannily like a Wes Anderson movie by way of Arrested Development. I read the book with Lucille and Buster Bluth in my mind as Frances and Malcolm as their characters/relationship are almost identical: Frances, the domineering, constantly-squiffy elderly mother used to a life of pampered luxury, and Malcolm, the hapless, coddled thirtysomething man-child, bumbling through life, content to be steered by his ma (though he doesn’t have Buster’s hook-hand!). And even though you could call French Exit derivative in that regard, deWitt’s execution is so perfect and so much fun to read, I couldn’t care less – not least as I love Wes Anderson and Arrested Development! The novel would have benefitted from an overarching plot as its directionlessness allowed for a lot of stagnation once all the characters had congregated in the Parisian apartment and the story noticeably slowed at a time – the final act – when it should be building to a climax. That and the surprisingly grim and underwhelming finale were the only aspects I disliked. I suppose the ending lives up to the title but it still felt like an awkward fit tonally for an otherwise breezy read. I was just hoping for something more imaginative and subversive. Otherwise, there’s nothing but good stuff to revel in! The cast are a delightfully eccentric bunch, the dialogue is consistently funny, almost every scene is amusing, and the overall effect is a charming and playful read. I also loved the well-calculated element of fantasy deWitt introduced into the story with the reveal of Small Frank’s secret, displaying a refreshingly carefree lack of confinement to genre, and his subtle but pointed refusal to explain it thereafter. I’d enjoyed The Sisters Brothers though not as much as many readers had. Perhaps this new offering from deWitt would charm we in a way that his Western novel had failed to? The story of a dysfunctional relationship between an unpleasant mother and her very odd son (not to mention the deceased father who may now be living within the body of the pet cat) is a very strange offering indeed. Wealthy widower Frances Price had gained notoriety – and social exclusion – as a result of her having discover I’d enjoyed The Sisters Brothers though not as much as many readers had. Perhaps this new offering from deWitt would charm we in a way that his Western novel had failed to? The story of a dysfunctional relationship between an unpleasant mother and her very odd son (not to mention the deceased father who may now be living within the body of the pet cat) is a very strange offering indeed. Wealthy widower Frances Price had gained notoriety – and social exclusion – as a result of her having discovered her husband’s lifeless body in the marital bed and then instead of notifying the appropriate authorities choosing to chase of to the ski slopes for the weekend. Very soon she’d picked up her son from the boarding school, in which he’d been imprisoned by the selfish mother and her even more self-centred husband, and launched into a self destructive spending spree. When the cash ran out she took the only option available which was to abscond to Paris where she set herself and her son up in a borrowed flat. There’s a bit more to this comedy of manners than that but, in truth, not a lot more. I suppose the attraction for some will be in the way the author ruthlessly satirises high society and it’s fair to say that it does have a sprinkling of clever lines and funny moments. But it all fell somewhat flat for me – I just couldn’t find it within me to get excited or even care about what happened to this implausible pair. I did manage to drag my way to the book’s conclusion, but only just. It’s an absurd and surreal novel that will, I’m sure, be a hit with some readers – but unfortunately not me. I learned about FRENCH EXIT through Buzz Books (Publishers Lunch). If you are not familiar with them, Buzz Books issues monthly publications where they list by category most books coming out that month, and also include a list of book excerpts from the list. I read the first chapter and was drawn by the writing and sharp dialogue. After living a comfortable and wealthy lifestyle, Frances Price and her son, Malcolm, find themselves completely broke and without a home. Thanks to Frances’ lifelong fr I learned about FRENCH EXIT through Buzz Books (Publishers Lunch). If you are not familiar with them, Buzz Books issues monthly publications where they list by category most books coming out that month, and also include a list of book excerpts from the list. Thanks to Frances’ lifelong friend, Joan, they will be able to move into her Paris apartment and avoid homelessness. Along with their cat, Small Frank, they embark on a transatlantic ship and head to their new residence. What follows is a humorous and amusing journey. I loved the dialogue, witticisms, and absurd scenes. The beginning was strong but I felt by the end the story had lost a bit of its footing. Still, the strength of the novel lies in its characters. Oh dear. I'd consider myself a big Patrick deWitt fan, having adored The Sisters Brothers and Undermajordomo Minor. But little of his famed wit and ingenuity is present in his latest novel. It has a cast of peculiar characters and a story that just goes nowhere. Frances Price is a wealthy 65-year-old New Yorker, a sharp-tongued widower who doesn't suffer fools gladly. Living with her in a luxurious apartment is her brooding son Malcolm ("a lugubrious toddler of a man") and their cat Small Frank, Oh dear. I'd consider myself a big Patrick deWitt fan, having adored The Sisters Brothers and Undermajordomo Minor. But little of his famed wit and ingenuity is present in his latest novel. It has a cast of peculiar characters and a story that just goes nowhere. Frances Price is a wealthy 65-year-old New Yorker, a sharp-tongued widower who doesn't suffer fools gladly. Living with her in a luxurious apartment is her brooding son Malcolm ("a lugubrious toddler of a man") and their cat Small Frank, in whom, Frances believes, the soul of her late husband resides. Money problems force the trio to move to Paris and on the journey, Frances decides to blow the rest of her fortune. In France they encounter some more unusual people, and the disappearance of Small Frank gives this unlikely bunch a mystery to solve. As with Dewitt’s delightful “Sisters Brothers”, we are treated again to quirky people in a minimalist, absurdist plot. This one wasn’t quite as zany, or as serious either. Still, it’s a fast read and left me with an amusing sense of an ensemble cast of simulacra strutting their stuff as partial people and, then, inevitably winding down. Our puppet people include the elderly golddigger Francis Price and her thirty-something son Malcolm, who are living the high life as residents on Manhattan’s Upp As with Dewitt’s delightful “Sisters Brothers”, we are treated again to quirky people in a minimalist, absurdist plot. This one wasn’t quite as zany, or as serious either. Still, it’s a fast read and left me with an amusing sense of an ensemble cast of simulacra strutting their stuff as partial people and, then, inevitably winding down. Our puppet people include the elderly golddigger Francis Price and her thirty-something son Malcolm, who are living the high life as residents on Manhattan’s Upper East Side in the long wake of the demise of the plutocrat father. Now the money has run out and Frances takes the opportunity of an exit to Paris, where they are offered a place to stay by a wealth friend. Malcolm is so tied to his mother’s challenging upkeep that he abandons his fiancé. On the cruise over they collect into their circle a jaded seer who does a convincing séance to communicate with the soul of the angry dead husband somehow inhabiting the odd cat they’ve smuggled from NYC. In Paris, the mother and son do a great performance as the “ugly Americans.” A neighbor woman who is a fellow American ex-pat worms her way into their life, mostly on the strength of her cooking. A bit of a goose who is not up to their snobbish cultural standards and too prudish for their predatory sexuality, but nonetheless a balm as a sycophant. Soon another joins their circle, a detective Francis has hired to find the cat when it goes missing. The spiritualist falls on hard times and is invited to stay. I loved the scenes of social entertainment among the five during evening drinking bouts when each is supposed to perform using their special talent. Most end up just telling a tale about their lives, which ends up being more revealing and honest than they can readily accommodate. A bit of a head scratcher when it comes to an answer what the “book is about.” I would say it’s a bit of a parable about how we need other people to become whole, especially in this modern time of broken families and corrupted values. And if you are playful enough and ready to takes risks you can find some complementarity or a virtual family for awhile with others. Would you like to read a laugh-out-loud funny, lighthearted, smart, sassy, somewhat dark and weird and fantastical novel that will take you completely away from current events and make you feel like you're eating birthday cake all day long, only now birthday cake is somehow good for you? Also, I would like to read an essay about how THE SISTERS BROTHERS is a Coen brothers movie and this one is a Wes Anderson movie. Noun. French exit (offensive) A hasty exit made without saying farewells to anybody. Frances Price – still beautiful, feared, and admired at sixty-five – has been burning through her husband's money in the two decades since his death. With the bank threatening to take away everything she has left, Frances heeds her financial advisor's warning to sell what she can and skip town; make a French exit, as it were. Although her son, Malcolm, is engaged to a lovely and devoted woman, Frances insists that he accompany her to Paris, and Malcolm can't help but comply: ever since Frances pulled him out of boarding school upon his father's death when the boy was twelve, Malcolm has rarely left his mother's side. Many interesting things happen in the present, various characters tell weird stories from their pasts, and there are many scenes urging us to be kind to immigrants, the homeless, the deranged. This book has more scenes with people talking about their feelings and attempting to verbalise their personal philosophies than I remember from previous deWitts, and I'd say it suffers for it. Mme Reynard became sheepish. “Occasionally I suffer from nightsickness,” she admitted. I don't really enjoy humour in books, and unlike some other readers, I didn't think there was anything funny or believable about this book. I've gained nothing from my experience and am surprised I actually finished it. Update 1-Oct-2018: Giller Prize Shortlisted! I've long been a fan of deWitt's writing and his latest novel, French Exit, feels like it could have been written by no one other than him, but also feels like a move in a different direction from The Sisters Brothers and Undermajordomo Minor . DeWitt has always been funny, but French Exit is a comedy first and foremost. I was definitely getting in a good belly-laugh every 10 pages or so, and its rare that an author is able to deliver the goods to c Update 1-Oct-2018: Giller Prize Shortlisted! I've long been a fan of deWitt's writing and his latest novel, French Exit, feels like it could have been written by no one other than him, but also feels like a move in a different direction from The Sisters Brothers and Undermajordomo Minor . DeWitt has always been funny, but French Exit is a comedy first and foremost. I was definitely getting in a good belly-laugh every 10 pages or so, and its rare that an author is able to deliver the goods to consistently over an entire novel. Fellow reader Sam Quixote pointed out in his review of the novel that the book operates on a kindred wavelength to the films of Wes Anderson. I didn't see it so much at the start of my reading, but by the time the formerly-wealthy Prices make their journey across the Atlantic and the quirky cast began to expand, I was feeling the Andersonian-vibes. If you've read and enjoyed anything by Patrick DeWitt before, then you're going to love what he's cooked up this year. The ending felt a bit off-tone compared to the rest of the novel, which knocked it down a touch from the full-five stars, but in no way spoils the experience. French Exit was a book I was always happy to come back to, and one that I tried to spread out over multiple readings to extend my enjoyment. This is deWitt at his most absurd, funny, and irreverent. Even if it isn't my favourite of his three major works, French Exit stands out as the funniest of the bunch. Highly recommended! 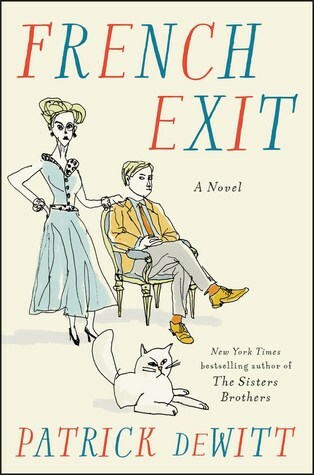 French Exit (aka ‘ghosting’) is apparently a term meaning to leave a social situation without saying goodbye to the hosts - a particularly apt title for this novel with the New Yorker socialite protagonists decamping to Paris after being declared bankrupt. Although I am a big fan of black comedy, I found this rather a difficult one to engage with until I tuned into the author's wavelength. The dysfunctional mother and son relationship reminded me of JK Toole's 'Confederacy of Dunces', and de Witt French Exit (aka ‘ghosting’) is apparently a term meaning to leave a social situation without saying goodbye to the hosts - a particularly apt title for this novel with the New Yorker socialite protagonists decamping to Paris after being declared bankrupt. Although I am a big fan of black comedy, I found this rather a difficult one to engage with until I tuned into the author's wavelength. The dysfunctional mother and son relationship reminded me of JK Toole's 'Confederacy of Dunces', and de Witt's stylish prose is also reminiscent of Oscar Wilde. It's an old-fashioned tragi-comedy of manners and social commentary, with an absurdist plot and a cast of stock farce dramatis personae, ripe for satire . I will certainly be reading more of this author’s novels. I’m afraid I didn’t get on with French Exit at all. It seems to me to be a novel which thinks a great deal of itself but adds up to very little. Frances, a wealthy, viciously bitchy, snobbish New York widow (Really? Again?) completely dominates her overweight, ineffectual son Malcolm, and destroys any other relationship he may develop (Really? Again?). Her financial profligacy means that she is reduced to the abject penury of her last few hundred thousand dollars, and her only (improbable) frien I’m afraid I didn’t get on with French Exit at all. It seems to me to be a novel which thinks a great deal of itself but adds up to very little. Frances, a wealthy, viciously bitchy, snobbish New York widow (Really? Again?) completely dominates her overweight, ineffectual son Malcolm, and destroys any other relationship he may develop (Really? Again?). Her financial profligacy means that she is reduced to the abject penury of her last few hundred thousand dollars, and her only (improbable) friend offers her use of a vacant apartment in Paris. This takes the best part of a hundred pages and although the book improves a bit in Paris, I simply couldn’t raise any interest in the story or its uninteresting and clichéd characters. We are told that Patrick deWitt is taking satirical jabs at his subjects, but to me it just felt like another uninteresting novel of New York’s rich – in whose lives the rest of the world ought to be hugely interested, apparently. Malcolm has a fiancé (well, any woman would fall in love with an obese, gauche, inarticulate man with some bizarre habits who is utterly dominated by his vile mother, wouldn’t she?) who at one point thinks, “The mother of the man she had accidentally fallen in love with did not approve of their union: this was so. But it was a common problem, wasn’t it? It was a trope.” Well, yes, it is, as is much of the rest of the book. The trouble is that none of it is much more than that. Oh, it’s “beautifully written” of course – but in that self-conscious “beautiful writing” way that makes it often seem tediously arch to me and sometimes downright mannered; the use of “this was so” in the little extract above, or “Malcolm was yet in his hotel room,” (“yet”?) for example. It just jars on me, seeming out of place in context and thoroughly self-regarding. French Exit has had some favourable reviews, but I found it to be dull, mannered and much of it was a struggle to get through. There have been some very fine novels involving New York’s rich; The Bonfire Of The Vanities, A Little Life and some others spring to mind, but this doesn’t have anywhere near their quality of satire or insight. I didn’t utterly hate it, but it was hard work and I really didn’t get much from it. I doubt whether I’ll bother with any more of Mr deWitt’s work. French Exit is deWitt’s fourth novel and I have read them all. He is best known for his Booker nominated “The Sisters Brothers”, scheduled for release as a movie in September 2018 (I’m looking forward to that!). But Ablutions and Undermajordomo Minor also share the dark comedy that is a trademark of deWitt’s writing. This novel is billed as a “tragedy of manners”, which I assume is a reference to a “comedy of manners”. It is important to note that as you head into the story. “Comedy of manners” French Exit is deWitt’s fourth novel and I have read them all. He is best known for his Booker nominated “The Sisters Brothers”, scheduled for release as a movie in September 2018 (I’m looking forward to that!). But Ablutions and Undermajordomo Minor also share the dark comedy that is a trademark of deWitt’s writing. This novel is billed as a “tragedy of manners”, which I assume is a reference to a “comedy of manners”. It is important to note that as you head into the story. “Comedy of manners” is a defined literary form of satire that targets contemporary society and societal norms. To do this, a comedy of manners often uses stock characters and often sacrifices plot (normally it is about a scandal of some kind) in deference to witty dialogue and social commentary. It helps to go into DeWitt’s new novel knowing this because the plot is absurd. If you read the book on the understanding that this is deliberate, it works. But don’t try to take it seriously. I laughed a lot while reading this book. You will too, I think, if you found The Sisters Brothers funny. Frances Price is a 65-year-old widow. Scandal has followed her since she found her husband dead on their floor and left him there without telling anyone while she headed off on a skiing trip. Before his death, her husband was fabulously wealthy and Frances has never known anything other than wealth. That is until her profligacy uses up all the money her husband left and she discovers, despite repeated warnings from her advisor, that she is broke. She and her son, Malcolm, head to a friend’s apartment in Paris with the cash they can pull together by selling their possessions. And with Small Frank, a cat who plays an increasingly important part in an increasingly bizarre plot. And Frances has a plan. I won’t spoil the book by revealing the plot, but I will say that you need to suspend disbelief because it heads off into left field and doesn’t show much sign of coming home. Until the very sad ending. You see, right at the start, a character says of Frances “He knew he should dislike this woman, but he didn’t or he couldn’t”, and that is the reader’s experience, too. She’s arrogant, she’s a snob, she manipulates people. But you can’t help yourself starting to like her and this means the ending packs a punch. One of the immigrants tries to fight back and is beaten unconscious. Later in the book, Frances is down there giving him money. Is she being philanthropic or is this part of her grand plan? Perhaps it is a bit of both. If you liked The Sisters Brothers, I would recommend this. It perhaps isn’t as good, but it is still an entertaining read. I haven’t even mentioned the bizarre way Small Frank gets involved with the plot! 3.5 stars, rounded up because it was fun. deWitt is a mordant genius. That's all. There is a tipping point, though, that feels something like drowning, and that too is appropriate to this book. I began to have a headache not unlike a hangover and to feel that perhaps I'd stayed too long and drunk in too much. I began to have regrets in which my immediate and long-term future felt suddenly and desperately bleak. Nevertheless, I pushed through to the sad and bitter end, not sure I'd come out the better for it. I read it all in one go, last night, and I'm still unsure and still nursing the headache. This book is a black comedy, yes indeed. I knew that going in. But really, there's probably something awfully wrong with a person who would find its satire satisfying all the way to the end. Are we supposed to find this book hilarious because it happens to the rich and egocentric? If the same exact book had been written about a poor, illiterate, backwater family, it would be considered a tragedy rather than a comedy. Nevertheless, there are quite a few stellar qualities to French Exit that are worthy of mention: the writing is very good even if it doesn't feel like "real life" to many readers; the characters are engaging and memorable; there are some exceedingly funny moments during which I actually laughed aloud, which I don't do very often whilst reading fiction; and there are exchanges of deep humanity, grace, and dignity where, when, and from whom, you least expect them. So, finally, there is an underlying message of compassion and connection that's delivered in castaway moments and settings, and in something other than a cold and flippant manner. Though one can never complain of deWitt being saccharine. In fact, he seems to live in terror of normal human sentiment, while making a joke at his own expense of cliche (which is funny since he's rarely that). The sincerity, though, it is there: It's swimming just beneath the icy surface. How refreshing it is to read a story with no physical violence, murder, psychological torture or with the ubiquitous unreliable narrator. deWitt, like Willy Vlautin is a highly underrated author. His amazing novel, The Sisters Brothers has a loyal following but it is no where near the size it should be. The central characters of French Exit are Franklin, Francis and their son Malcolm. Franklin Price has made a fortune as a ruthless and ethically suspect litigator. When we meet Frances, it is 20 ye How refreshing it is to read a story with no physical violence, murder, psychological torture or with the ubiquitous unreliable narrator. The central characters of French Exit are Franklin, Francis and their son Malcolm. Franklin Price has made a fortune as a ruthless and ethically suspect litigator. When we meet Frances, it is 20 years after Franklin's death and she has blown through his entire fortune. With only a small remnant left, she decides to go to France with Malcolm and her cat, Small Frank in order to gain time to decide her next step. While there, she unwittingly meets a perfectly enigmatic cast of characters that aid in her decision. French Exit is a story about people and their desire for connection. It is about their flaws, their vulnerability and ultimately their humanity. Patrick deWitt's strength is in creating engaging characters that do really eccentric things yet become endearing. His prose is sharp, sparkling, darkly humorous and totally enchanting. However, the extraordinary quality of French Exit is that it feels like it was entirely written by a woman. It is a testament to his writing skill that he can come completely out of himself and embody a woman like Francis Price, or Mme Raynard, or Susan or Madeleine or Joan and he does it masterfully. French Exit is wonderful and I have nothing but praise for Patrick deWitt. If you liked The Sisters Brothers, I think you'll enjoy this as well. Is it just a coincidence that both he and Willy live in Oregon? Frances Price has always been a bit frightening. Her name is well known around the Upper East Side for her beauty, snobbery, and especially for scandal. Years ago when she found her sleazy lawyer husband dead from a heart attack, she left their home and went on a ski trip, not bothering to inform anyone of his death. This has left tongues wagging for twenty years but a new scandal is on the horizon: she's almost broke. Frances packs up her adult son Malcolm and their cat Frank (the reincarnatio Frances Price has always been a bit frightening. Her name is well known around the Upper East Side for her beauty, snobbery, and especially for scandal. Years ago when she found her sleazy lawyer husband dead from a heart attack, she left their home and went on a ski trip, not bothering to inform anyone of his death. Frances packs up her adult son Malcolm and their cat Frank (the reincarnation of her deceased husband) to leave behind the gossip for Paris. In the City of Lights, mother and son meet a quirky cast of characters beginning with their strange new friend Mme. Reynard who is starving for attention and decides to move in though no one has invited her. When Frank the cat goes missing, Frances hires a P.I. to search for a woman Malcolm met on their Atlantic crossing who claimed to be psychic. The P.I. returns with the psychic who contacts Frank to find out why he has run away. Meanwhile, Malcolm's sort-of girlfriend Susan shows up with her new fiancee Tom, who is disgusted with her continued hang up on Malcolm. With an apartment full of strangers turned (uninvited) house guests, Frances burns through the last of the money as quickly as she can while looking back on the prime of her life and her relationships with her husband and son. In an oddball tale of social outcasts (both human and feline), deWitt targets high society in a dark comedy with a few gems of insightful wisdom and plenty of eyebrow-raising conversations. French Exit proves to readers that money can't buy everything, especially manners and love. Thanks to Ecco and Edelweiss for providing me with a DRC in exchange for my honest review. French Exit is scheduled for release on August 28, 2018. But soon a more uneasy sense of something starts to seep through: Malcolm’s abandonment at school until his father dies and his glamorous, eccentric mother pitches up to take him gloriously away; the moment when Frances tells her lawyer that she’d expected to die before she’d spent her way through her husband’s fortune, and yet she’s still here. For all the romp and farce there’s an underlying sense of tragic existential unease... and *that* ending. Witty, for sure, but there’s more to this than meets the eye: 3.5 stars. This was my first taste of deWitt, and while for the most part I thoroughly enjoyed it, and it was very fast-paced and often LOL funny, the denouement didn't really work for me ... it started to go downhill about the time Small Frank starts speaking as Franklin, and from there my suspension of disbelief kept getting more and more tried. Regardless, for a silly and fun romp it isn't a bad time pass, and if Cate Blanchett is as smart as I take her for, she will immediately phone 3.5, rounded down. Beautifully written, at times hilarious, riddled with supernatural mysteries and featuring one of the most unforgettable cats I've read in a long time, the book - much like the life of its protagonists - is a thing of beauty cursed by chronic pointlessness. Not a problem to me, but I fear the wrong reader may find this book insufferable. If you haven't read DeWitt's The Sisters Brothers, it makes little sense to choose this over that one. (3.25) If you’ve read The Sisters Brothers, you’ll recognize deWitt’s deadpan, black humor here. This story of a prickly mother and her hapless son is less violent but more caustic, and initially difficult to love because of the characters’ flippancy and the unrealistic dialogue. No one really talks like this, I kept thinking to myself. But Frances and Malcolm grew on me as they sail from New York City to Paris and settle into a friend’s apartment with the cat Small Frank – no ordinary feline bu (3.25) If you’ve read The Sisters Brothers, you’ll recognize deWitt’s deadpan, black humor here. This story of a prickly mother and her hapless son is less violent but more caustic, and initially difficult to love because of the characters’ flippancy and the unrealistic dialogue. No one really talks like this, I kept thinking to myself. But Frances and Malcolm grew on me as they sail from New York City to Paris and settle into a friend’s apartment with the cat Small Frank – no ordinary feline but an embodiment of Frances’ late husband. When Small Frank goes missing, mother and son enlist the services of a private investigator to find the medium who was a fellow passenger on the boat so they can have a hope of reconnecting with him. My first novel by DeWitt and probably not a good place to start. I found this very disappointing. There are flashes of wonderful writing, but the novel doesn't hang together at all. It starts out as a wickedly satirical take on the obscenely wealthy and ends up as a sentimental fable. I went with the complete unreality of the first part because the writing was deft and I was impressed by DeWitt's apparent commitment to creating characters who were unlikeable yet interesting 2.5 stars rounded up. My first novel by DeWitt and probably not a good place to start. I found this very disappointing. There are flashes of wonderful writing, but the novel doesn't hang together at all. It starts out as a wickedly satirical take on the obscenely wealthy and ends up as a sentimental fable. I went with the complete unreality of the first part because the writing was deft and I was impressed by DeWitt's apparent commitment to creating characters who were unlikeable yet interesting (Malcolm was interesting despite being a complete blank in many ways). I didn't really believe that someone as unpleasant as Frances could be so charismatic, but again, I was willing to buy the setup. But when the setting shifted to Paris, the satire softened and we were confronted with psychic phenomena, uncomfortable scenes set in a reality that was much harder to hand-wave away as funny (a riot and police action against homeless immigrants in a park, watched by the wealthy and bored, from the vantage point of the latter? Why? ), and redemption for people who had done absolutely nothing to get to that point, let alone earn it. The symbolism was on-the-nose (Frances buys Malcolm a bicycle), the coincidences started to pile up, and the characters became imbued with attitudes and beliefs that, had they had them from the beginning, would have saved them from their various fates. This is billed as a "tragedy of manners" but I'm not sure what's tragic about people reaping what they have very clearly sown, despite more opportunities than most people have to take other paths. Unless the messages are that (a) money doesn't buy happiness; (b) childhood trauma happens to the rich and the poor; and (c) friends are important even when you're wealthy. No kidding. It's much harder to write biting social satire than it looks. That's why we consider Barbara Pym, Muriel Spark, and their fellow writers underrated. This novel attempts to do that but doesn't succeed. It takes more than an excellent facility with language (which DeWitt has, despite some odd word choices). It takes a deep understanding of context and people, neither which are much in evidence here. It's not even an amusing trifle, because it left a bad taste in my mouth. I started “French Exit” after dinner last night even though my book club isn’t scheduled to discuss it until the end of the month. By 10am the next morning I had finished it in three sittings, eighteen hours later. I loved this book. I found it laugh-out-loud irreverent, charming, and thoroughly engaging. The book begins with a bang and the pacing does not slow until the last page. After the death of the family patriarch, Franklin, his wife, Frances, and son, Malcolm, are out of money. Forced to sell all of their physical possessions before repossessed by the banks, the mother and son head to Paris with their cat*, Small Frank, in tow. A New Leaf was a film made in 1971, a brilliant black comedy, starring Walter Matthau and Elaine May who also wrote the script. It told the story of a stupendously wealthy and obnoxious man who is one day informed that his money has run out. Patrick deWitt’s new novel, French Exit, offers up a similar proposition and it features the nastiest character I have ever come across in fiction. Stunningly beautiful Frances Price is a vile but strangely magnetic 65-year old whose The ‘heroine’ from hell. I know I just said this about a recent book, but it's true again! Wes Anderson should direct the movie. That might be all you need to know about the tone/humor/dark/quirky book that this is. I enjoyed it thoroughly, though at one point in the middle I was worried it had lost it's way. I was wrong. I can't wait to discuss it with my book group on Sunday. I'll add an update afterwards. BONUS: I feel better about my own parenting skills now. But we had a FANT I know I just said this about a recent book, but it's true again! Wes Anderson should direct the movie. That might be all you need to know about the tone/humor/dark/quirky book that this is. But we had a FANTASTIC discussion and tears (of laughter) were shed.